British rising four-piece, Sundara Karma released a moving visual for track “Happy Family” – PRESS HERE to watch via The FADER. The video complements the alt rock song’s folk-inflected stomp by capturing a heartfelt story of a pre-teen boy left home alone to fend for himself while clearly missing his absent mother. Sundara Karma made their debut at this year’s SXSW playing showcases for BBC, Austin City Limits, House of Vans, Clash and more, garnering praise for their fresh look and sound from the likes of The New York Times, SPIN and Paste. The band will return to North America next month (April 2017) for a select run of spring headline shows and tour dates on Alt Nation’s Advanced Placement Tour. The UK rising stars released their debut album, Youth Is Only Ever Fun In Retrospect, earlier this year via Bee & El/Sony RAL. Their captivating live performances and anthemic tracks have garnered praise from NME, DIY, The Guardian, Brooklyn Vegan, Under the Radar, Annie Mac at BBC Radio 1 and many more, plus they recently graced the cover of Dork Magazine. The band was introduced to the US with single “Loveblood,” and new single “She Said” is already making a splash, securing major radio airplay as the #1 most added at Alternative Radio on its first radio impact week. It hit TOP 30 last week! Sundara Karma kicked off 2017 with a sold-out headline UK tour and a run of UK dates with Two Door Cinema Club. Last year, the band made their debut opening the main stage at the UK’s biggest music festival, Reading & Leeds 2016, and co-headlined a run of US dates on the first ever BBC Music Presents US tour. 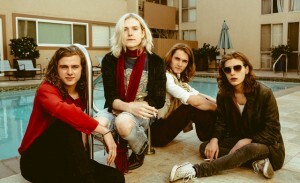 Sundara Karma – meaning “beautiful karma” in Sanskrit – are Oscar Pollock (vocals/guitar), Haydn Evans (drums), Dom Cordell (bass) and Ally Baty (guitar). Thanks for your time! What are some words you would use to describe the last year for the band? What have been some of the highlights for you all and your music? What are you most excited about for 2017? Splendid, temperamental, catastrophic. We’ve been in America quite a bit recently and have some great memories of driving through the country. It’s hard to pin point a handful of highlights when we’ve been together for so long so it’s really just a joy to be getting through life never having held down a proper job. It feels like it yeah. We’ve all grown up with each other and I can’t really remember a time when we weren’t jamming. Haydn and I have been in bands together since we were 8 and the funny thing is when we were younger we wanted to be the biggest band in the world, now we’d rather not have all the fuss and just have the freedom to create music we want to create. The name means ‘Cheerios’ in Japanese. In early January, you released your debut album. What did that feel like? How long had you been working on it? You know, it wasn’t actually all that brilliant of a feeling. We appreciate the album as a documentation of all the years we’ve spent together but it’s not something life changing and we’re aware of that. Your single, “She Said” has already received a lot of airplay. What was the inspiration for it? It’s a huge ode to The Smiths that song and especially to Morrissey. Juxtaposition is their thing and I just fancied the idea of writing a ‘going out’ song about not wanting to ‘go out’. How was your US Fall tour? What were some of your favorite venues to play at? It was hilarious. Chicago was sweet. San Fran was super tasty! We were in LA for about a week between shows venturing through flea markets and ridiculous coffee shops. To be honest that’s all we seem to do. It’s nice to be able to play smaller shows again and actually see all the faces of the people watching you. This Spring, you have a tour coming up with Alt Nation. Where are you excited to play at the most? How do you keep up the energy night after night on a tour like this one? You get into the swing of things after a few days, it gets in your blood. Berocca and vitamin c have been very kind to us. Also, I suppose reminding ourselves of how lucky we are to be playing shows to people who have paid and want to hear our songs is enough to give you that extra push on a tough day. I think our biggest surprise is how little everyone actually knows, not in a discrediting sort of way, just in the sense of how there is no blue print you can follow of what will work and what won’t work. A lot is down to luck. For me what comes naturally is writing, it’s all I tend to do when we get back from tours. I don’t know if that’s for me to say. I just try to make the songs as honest as possible and if people can take something from that then great. I like the idea of our music connecting with and helping people but I’d hate to limit it by saying it’s meant to do this or that if you know what I man. I can really get into binge eating. I then counterbalance this by going for long runs and walks. Being amongst the trees always helps. Ally says, “He doesn’t support the recreational use of ketamine”. Hope this helps, thank you!